Sign Up for Recipes and News! We'll be adding delicious lamb recipes to this page frequently. The best way to hear about a new recipe is to sign up for our newsletter above. 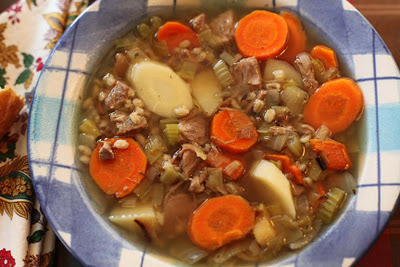 A fall and winter favorite here at our farm, Scotch Broth Soup is total comfort food. The smooth taste of the lamb stock mixed with winter root veggies can’t be beat. I use our shoulder chops for the meat and add a few extra bones if I have them to make a richer stock. Resist the temptation to increase the barley - you don’t need a lot and it will swell by the second day. In fact, when re-heating, you may find it necessary to add a little water. This soup also freezes well. Brown the stew meat in a large soup pot. Dice the onion and add it to the meat in pan. Cut the leek into thin slices. Add to the meat and onions. Chop the celery and add to the browning meat mixture. While meat mixture is browning, peel the turnips, carrots, and potatoes. Chop turnips, carrots and potatoes into pieces all the same size so they will cook at an equal rate. Once the meat is thoroughly browned, cover with water. Bring to a boil, then lower immediately to a simmer. After five minutes, add the barley, root veggies, herbs and salt and pepper. Cover and cook until barley is tender - about 45 minutes. Remove bones from shoulder chops if necessary. Serve immediately. This soup, as with most, will taste better the second day. It will be necessary to add some water when re-heating as the barley will swell. This soup freezes nicely too.